That's what $3 million buys you these days. Beautifully customized with a range of unique touches, the Huayra BC is covered from bumper to bumper in this sublime red carbon fiber, complemented by a subtle red pinstripe on the side skirts as well as the engine bay and cabin. The Italian tricolore of green, white, and red frames an exposed carbon-fiber section on the hood, while other special adornments include a red Huayra BC badge and gold crowns beneath the aero flaps at the rear. 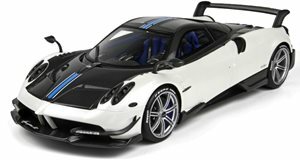 The typically jaw-dropping interior Pagani is so renowned for comes swathed in black aluminum, two-tone red and white leather and dark carbon fiber. with a 2.35 million Euro price tag. We’d guess that not one of the 20 units being made will sell for that sum with unique customizations such as the ones made to this exquisite example no doubt boosting the final price closer to 3 million Euros or just under $3.4 million. Still, looking at these images, that's money well spent.